Why the 2008 Mazda CX-7? excellent visibility/ high position. Love the raked windshield. Seat is very comfortable but it could be more snug to avoid body roll. I love the way the car looks. good flowing lines, muscular facia and bulged fenders. Shame on Mazda for making cars that show consistent lack of quality. My car has a trip computer that is not operable on year 2008. My brother has same car in 2009 and his car has trip computer that actually was activated to work unlike my car. bad fuel economy, I guess thats why 2006-2008 models do have a trip computer but the trip computer was not able. 2009 to present all have same trip computer that provides MPG,distance to empty and somewhat of an improved gas mileage. 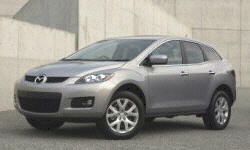 Why Not the 2008 Mazda CX-7? good size engine but poor engine management computer as turbo lags when push hard. premature wear of belts, pulleys, fuel injection and seals in engine, Turbo requires maintenance and oil is burnt to a crisp in the engine due to design flaws that Mazda is aware of. Poor engine design for the turbo engine. Car is no longer produced in the USA. rough ride and too much noise from the exterior that leaks directly into cabin. I own a Acura MDX and that car is solid and virtually no noise can be heard from the outisde when the windows are up.